NEW YORK (WABC) -- The Yankees are one step closer to reaching the World Series after Wednesday night's win in Cleveland. The Bronx Bombers stunned the Indians by winning three straight games after losing the first two games of the American League Division Series. The day after, some fans are savoring the victory by updating their wardrobes. 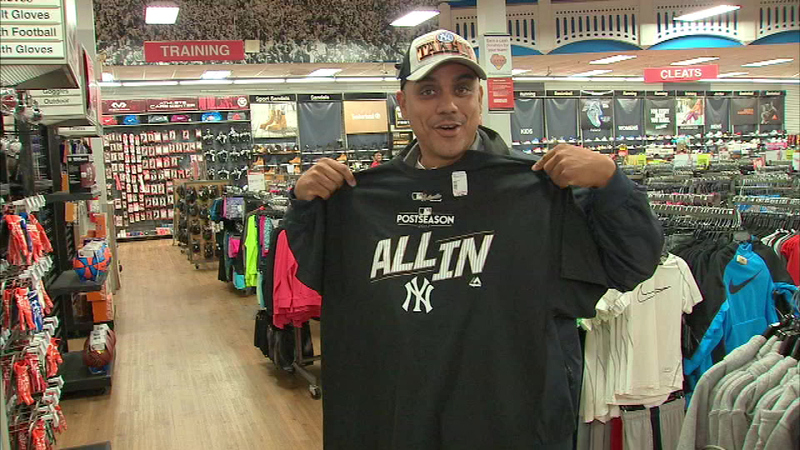 At the Modell's in Soundview, fans were snapping up commemorative hats and T-shirts. "I'm very excited," fan Maria Portella said. "I can't wait for them to win it all and go all the way." The Yankees now face the Houston Astros in the American League Championship Series. "They have a great team," Carlos Gonzalez said. "They're one of the best teams in the majors, but we're definitely going to take them out. We're hot and we're hungry this year." Game one is Friday night.